address bar The pane in the browser window of Internet Explorer that holds the current document's URL. You can type a URL in this box and press Enter to access a Web page. See also location field. all-in-one search tool A tool that provides search forms for several search engines and directories all in one site. The tool also provides hyperlinks which allow you to go to the services directly. annotated directories Often referred to as virtual libraries, these directories have brief summaries, descriptions, ratings, or reviews attached to Web pages and subject guides. annotation A brief summary or description of a Web page or of any work listed in a database. anonymous FTP A means of using FTP to make files readily available to the public. If you start an FTP session with a remote host, you give the log in or user name anonymous and enter your email address as a password. When you use a URL starting with "ftp://" and a domain name with a Web browser, an anonymous FTP session begins, and you don't have to enter a user name or password. attachment A file that is sent as part of an email message but that is not part of the main message. Usually images, programs, or word processor files are sent as attachments, because most email programs allow only plain text in the body of a message. bibliographic database An online database that lists sources of information and describes the information but that doesn't include the text of the information itself. Some bibliographic databases are annotated, which means that there is a brief summary of each work listed. blog A Web site that is updated frequently with new information about a particular subject or range of subjects. Entries can be provided by the site owner, taken from other Web sites or outside sources, or contributed by users. Content is displayed in reverse chronological order, and comments from readers are often encouraged. While most blogs are text-based, there are also blogs that focus on music, art, video and audio. blogroll A list of blogs that a blog writer, or blogger, recommends to others. bookmark A hyperlink that is saved in the bookmark list, a file in your browser. You can use bookmarks to keep track of favorite or important sites and to return there whenever you are on the World Wide Web. See also: Favorite. Bookmark list A list of hyperlinks to items on the World Wide Web. Boolean logic Search expressions that use Boolean operators (AND, OR, and NOT) in the search expression. Especially helpful in multifaceted or specific topics, Boolean operators help expand or narrow the scope of your search. A search for rivers OR lakes returns all documents with both words or either word in them. A search for rivers AND lakes returns documents with both words in them. A search for rivers AND lakes NOT swamps returns only documents that mention both rivers and lakes but omits those that also mention swamps. browsing The process of clicking from one hyperlink to another on the World Wide Web. You can browse indiscriminately, or you can do structured browsing, using a hierarchical subject list in a directory. case sensitivity The ability of a search tool to distinguish between uppercase and lowercase letters. Some search tools aren't case sensitive; no matter what you type, the tool only picks up lowercase matches. Search engines that are case sensitive will strictly follow the search request; they'll return documents containing the words in the case in which they were entered in the search expression. client/server The interaction between a system that requests information (the client) and another system that provides it (the server). The browser is the client, and a computer at the site that provides the information is the server. cloud computing The phenomenon of storing information on servers outside of your own computer and using Internet-based software to access and manage it. commercial database A database that requires you to pay a subscription cost before accessing it. See also proprietary database. compressed file A file that has been processed by a program that applies an algorithm or scheme to compress or shrink a file. A compressed file must first be uncompressed or transformed before it can be read, displayed, or used. Files available through anonymous FTP are often stored in compressed form. concept searching A feature enabling a search engine to find synonyms in its database. When you type in a word or phrase, the engine automatically searches for the word or phrase you want, plus words or phrases that may mean the same thing. For example, if the word teenage is in your search expression, the search engine would also look for the word adolescent. content area The part of a Web browser window that contains the current Web page, including images, text, or hyperlinks. cookie A relatively small piece of information that is initially placed on a client’s computer by a Web server. Once a cookie is present, the same Web server may read or rewrite the cookie. A Web server requests or writes a cookie to your computer only if you access a Web page that contains the commands to do that. Cookies are used to store information such as your login name and password or information about what portions of a Web site were visited on your computer. Sometimes viewed as an invasion of privacy, cookies are useful to you in some cases. Cookies can be used to keep track of your password or keep track of some preferences you’ve set for every visit to that site. You can set preferences in your browser to accept or reject cookies. copyright The right to copy or duplicate material such as images, music, and written works. Only the owners of the information can grant this right. Regardless of whether information on the Internet or a Web page is accompanied by a statement asserting copyright, it is still protected by the copyright laws of the United States, the Universal Copyright Convention, or the Berne Union. default setting The configuration a search engine uses unless you override the setting by specifying another configuration. For example, in most search engines, the Boolean operator OR is the assumed relationship between two words unless you type AND between the words. Dewey decimal classification system Originated by Melvil Dewey in the late nineteenth century, this classification system for library materials divides all knowledge into ten different classes, which are then subdivided into several sets of subclasses. Within these subclasses, decimals reflect still smaller subdivisions. The Dewey decimal classification system is most prevalent today in public libraries, whereas most other types of libraries, including academic ones, use the Library of Congress classification system. directory Topical lists of Internet resources, arranged hierarchically. Directories are meant to be browsed, but they can also be searched. Directories differ from search engines in one major way -the human element involved in collecting and updating the information. directory database A database that provides brief descriptive information about people, businesses, places, and other facts. domain name The Internet name for a network or computer system. The name consists of a sequence of characters separated by periods, such as www.mwc.edu. The domain name is often the first part of a URL that follows "://". For example, the domain name in the URL http://www.ckp.edu/technical/reference/wsftp.html is www.ckp.edu. downloading Transferring or copying a file from another computer (the remote computer) to the computer you're using (the local computer). This term is often applied to the process of retrieving a file from a software library or FTP archive. FAQ (frequently asked questions) A list of commonly asked questions and answers on a specific topic. A FAQ is often associated with Usenet newsgroups, but several search tools also include a FAQ file. This, and online help, is usually the first place you should look to find answers. favorite A hyperlink that is saved in the favorites list. You can use favorites to keep track of useful or important sites and to return there whenever you are using your browser. See bookmark. favorites list The name the Internet Explorer browser gives to the collection of favorites. The browser includes menu bar and toolbar links to the favorites list. field searching A strategy in which you limit a search to a particular field. In a search engine, you might search only the URL field. In a library catalog, you could search for items by author, title, subject, call number, or any other data element that was designated as a field. By narrowing the scope of searchable items, field searching helps to eliminate the chance of retrieving irrelevant information. flame An email message or article in a Usenet newsgroup that's meant to insult someone or provoke controversy. This term is also applied to messages which contain strong criticism of or disagreement with a previous message or article. folksonomy Words and phrases that users attach to Web resources. These words or phrases are chosen freely by individuals rather than using a controlled vocabulary invented by someone else. frames Some Web pages are divided into rectangular regions called frames. Each frame has its own scroll bar, and in fact, each frame represents an individual Web page. freeware A software program that's available for use without any charge. This doesn't mean the program isn't copyrighted. Usually, the originator retains the copyright. Anyone can use it, but the program can't be legally sold or distributed without permission. full-text database A database that contains the full text of the information it describes. Full-text indexing A search engine feature in which every word, significant or insignificant, is indexed and retrievable through a search. G Gopher A menu-oriented system that gives access to documents, files, and other Internet services, regardless of where they are on the Internet. The software for Gopher was created and developed at the University of Minnesota to allow users to browse and retrieve documents in a campus environment. GUI (graphical user interface) An interface that uses icons and images in addition to text to represent information, input, and output. helper applications Programs used with a Web browser to display, view, or work with files that the browser cannot display. For example, Netscape Navigator can display graphic or image files in GIF or JPEG format. If you accessed an image of another type through a hyperlink, then your browser would need a helper application to display it. As another example, some Web browsers can work with several protocols but not with Telnet. If you activate a hyperlink that begins a Telnet session, a Telnet client that is separate from the Web browser must be used. The Web browser can recognize when it's necessary to use specific helper applications. hidden Internet See invisible Web. high precision/low recall A phenomenon that occurs when a search yields a small set of hits. Although each one may be very relevant to the search topic, some relevant documents will be missed. history list A list of Internet sites, services, and resources that have been accessed through a Web browser during recent sessions. hit list A list of results obtained from an online search. hyperlink Words, phrases, images, or regions of an image that are often highlighted or colored differently and that can be selected as part of a WWW page. Each hyperlink represents another Web page; a location in the current Web page; an image, audio, video, or multimedia file; or some other resource on the World Wide Web. When the hyperlink is selected, it activates the resource that it represents. implied Boolean operators Using the characters + and - to require or prohibit a word or phrase as part of a search expression. The + acts somewhat as AND, and the - acts as NOT would in a Boolean expression. For example, the Boolean expression rivers AND lakes NOT swamps may be expressed as +rivers +lakes -swamps. interest group Group discussion and sharing of information about a single topic carried out via email. Internet The collection of networks throughout the world that agree to communicate using specific telecommunication protocols, the most basic being the Internet Protocol (IP) and transmission control protocol (TCP), and the services supplied by those networks. invisible Web Information that is not accessible via search engines. Also referred to as the hidden Internet. IP address An Internet address in numeric form. It consists of four numerals, each in the range of 0 through 255, separated by periods. An example is 192.65.245.76. Each computer connected to the Internet has an IP address assigned to it. The IP address is sometimes used for authentication. ISP (Internet service provider) A usually commercial service that provides access to the Internet. Fees often depend on the amount of time and the maximum possible speed, in bits per second, of access to the Internet. keyword indexing A feature in which each significant word in the entire document or record is indexed and retrievable by the search engine or computer program being used. keyword searching A feature in which the search engine or computer program searches for every occurrence of a particular word in the database, regardless of where it may appear. LCSH (Library of Congress subject headings) A list of standardized subject headings that are used to index materials by the Library of Congress. The subject headings are arranged in alphabetical order by the broadest headings, with more precise headings listed under them. Most academic library catalogs are searchable by subject heading as well as by keyword. Library of Congress classification system Designed originally for the Library of Congress in the late nineteenth century, this classification system is used by most academic and special libraries throughout the United States and in many parts of the world. It consists of twenty-one classes, each designated by a letter of the alphabet. Subdivisions are created by the use of other letters and numbers. library catalog A searchable database of a library’s holdings. limiting by date A search tool feature that allows you to limit search results to pages that were indexed after, before, or within certain dates. location field The pane on the browser window that holds the current document's URL. low precision/high recall A phenomenon that occurs during a search when you retrieve a large set of results, including many unwanted documents. mashup A Web page or application that combines information from two or more sources. A mashup combines one set of data with other data to make the original data more meaningful. menu bar The sequence of pulldown menus across the top of the Web browser window. All browser commands are embedded in the menu bar. meta-search tools Tools that allow you to search either more than one search engine or directory simultaneously or a list of search tools that can be accessed from that site. These two major types of Metasearch tools are called parallel search tools and all-in-one search tools. meta-tags Keywords inserted in the meta-tag portion of the HTML source document by the Web page author. If Web pages don't have much text, meta-tags help them come up in a keyword search. metadata Secondary information that describes an item. microblog A site that creates a network of users who write short updates (usually around 140 characters) on just about anything they want to write about. The most popular microblogging service is Twitter. moderator A person who manages or administers a discussion group, interest group, listserv list, mailing list, or Usenet newsgroup. In most cases, the moderator is a volunteer. Messages sent to the group are first read by the moderator, who then passes appropriate messages to the group. modifying search results Changing an initial search expression to obtain more relevant results. This can involve narrowing the results by field, limiting by date, adding keywords, subtracting keywords, and so forth. nested Boolean logic The use of parentheses in Boolean search expressions. For example, the nested expression ((rivers OR lakes) AND canoeing) NOT camping will first find resources that contain either the words rivers or lakes and the term canoeing but not resources that contain the term camping. newsgroup A collection of Usenet articles arranged by topic. Some are specialized or technical groups (such as comp.protocols.tcp-ip.domains-topics related to Internet domain style names), some deal with recreational activities (such as rec.outdoors.fishing.saltwater-topics related to saltwater fishing), and one, news.newusers.questions, is dedicated to questions from new Usenet users. OPAC (Online Public Access Catalog) An electronic catalog of a library's holdings, usually searchable by author, title, subject, keyword, and call number. Thousands of OPACs from libraries all over the world are available on the World Wide Web. open access Information that is freely available on the Internet without financial, legal, or technical barriers. parallel search tools A search tool or service that takes one search expression, submits it to several search services, and returns selected results from each. This is an example of a Metasearch tool. plug-in An application software that's used along with a Web browser to view or display certain types of files as part of a Web page. Shockwave from MacroMedia is a plug-in that allows the browser to display interactive multimedia. podcast Formed from the name of Apple’s portable digital player, the iPod, and the word “broadcast,” the term podcast refers to a digital recording that can be downloaded to a computer or some other digital device. proprietary database A privately owned database that isn't available to the public and that is usually password protected. Universities, businesses, and research institutes are the institutions most likely to subscribe to this kind of database and make it available to their employees and students. reference work A resource used to find quick answers to questions. Traditionally thought of as being in the form of books (such as dictionaries, encyclopedias, quotation directories, manuals, guides, atlases, bibliographies and indexes), a reference source on the World Wide Web closely resembles its print counterpart. A reference work doesn't necessarily contain hyperlinks to other resources, although it will often have hyperlinks within the document itself. results per page A feature of some search engines that allows you to designate the number of results listed per page. Search engines usually list ten results per page. RSS Really simple syndication, RDF Site Summary, or Rich Site Summary. RSS is an XML, or Extensible Markup Language based format for distributing and aggregating Web content. RSS newsreader Software that allows you to receive, within one page, news and other sources in XML-based formats, using RSS technology. scroll bar The rectangular area on the right side of the window that allows you to move up or down in the open document. You move by clicking and dragging it or clicking on the arrow at the bottom of the bar. 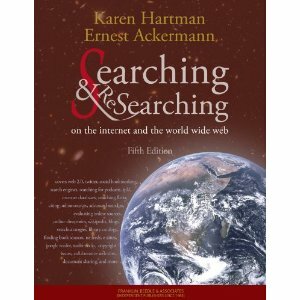 search engine A collection of programs that gather information from the Web (see spider), index it, and put it in a database so it can be searched. The search engine takes the keywords or phrases you enter, searches the database for words that match the search expression, and returns them to you. The results are hyperlinks to sources that have descriptions, titles, or contents matching the search expression. search expression The keywords and syntax that you enter in a search form. With this expression, you ask a search tool to seek relevant documents in a particular way. search form The rectangular pane or oblong box that appears on the home pages of most search engines and directories. In this space, you enter a search expression. search tool See directory and search engine. social bookmarking services A method for people to store, organize, search and manage bookmarks of Web resources by using subject headings, or tags, to help manage them. social networking A popular way for people to build online communities to communicate and share information and interests. sorting An option in some search engines that allows you to determine how you'd like your search results listed-by URL, relevance, domain or location, date, and so on. special collection A collection of material, usually a separate collection of a large library, that focuses on a particular topic and covers it in great depth. special library A library that focuses on the interests inherent in the institution it serves. Libraries in hospitals, corporations, associations, museums, and other types of institutions are all special libraries. In many cases, they are not open to the public. A special library's collection may be narrow in scope, but it will have depth within the specialty it covers. status bar The bar or rectangular region at the bottom of the browser window that displays information regarding the transfer of a Web document to the browser. When the mouse moves over a hyperlink, the status bar shows the hyperlink's URL. When a Web page is requested, the status bar gives information about contacting and receiving information from a server. During transmission, the status bar displays a percentage that reflects how much of the document has been transferred. The status bar also indicates whether transmissions are occurring in a secure manner. stop words Words that an indexing program doesn't index. Stop words usually include articles (a, an, the) and other common words. structured browsing The process of moving through a hierarchically arranged Web directory from a broad subject heading to a more specific one until you find the desired information. subcategory A subject category that is more narrowly focused than the broader subject category above it in a hierarchy. syndication Making information on a Web site available as an RSS feed so that it can be distributed easily to other sites, such as RSS newsreaders. tag cloud A visual depiction of user-generated tags. TCP/IP (transmission control protocol/Internet protocol) A collection of protocols used to provide the basis for Internet and World Wide Web services. toolbar The sequence of icons below the menu bar. Clicking on a toolbar icon executes a command or causes an action. truncation The phenomenon in which you cut off the end of a word when creating a search expression. When given such a request, a search engine will look for all possible endings to the word, in addition to the root word itself. unified search interfaces Metasearch tools that allow you to use several search engines simultaneously. uploading Transferring a file from a local computer (the one you're using) to another, remote computer. URL (Uniform Resource Locator) A way of describing the location of an item (document, service, or resource) on the Internet and specifying the means by which to access that item. Usenet news A system for exchanging messages called articles arranged according to specific categories called newsgroups. The articles are passed from one system to another, not as email between individuals. vendor A company that markets online catalog systems to libraries. Web 2.0 A perceived second generation of web development and design that aims to facilitate communication, secure information sharing, interoperability, and collaboration on the World Wide Web. Web hosting service A commercial service (in most cases) that provides a Web server to host a Web site. Fees often depend on the amount of disk space available, monthly traffic measured in bytes, and types of services that are provided. white pages service A search service available on the World Wide Web that finds the email or street address of an individual, business, or government agency. wiki A page or a collection of Web pages designed to enable anyone who accesses it to contribute or modify content using a simplified markup language. wildcard A character that stands in for another character or group of characters. Most search tools use an asterisk for this function. Although the wildcard is most often used in truncation, it can also be used in the middle of words (for example, wom*n). XML Extensible Markup Language is a standard text format for structured documents and data on the Web. XML uses a tag system similar to HTML but where HTML’s tags describe how content will be displayed, XML tags define the data in the tagged elements, making information sharing easier. yellow page services Web-based business address and telephone directories. zipping Putting a collection of filesinto an archive in a compressed format. That way a collection of fiels can be transmitted as one file.